Hello foodie buddies! I am back once again, this time with Britannia Good Day Chunkies. 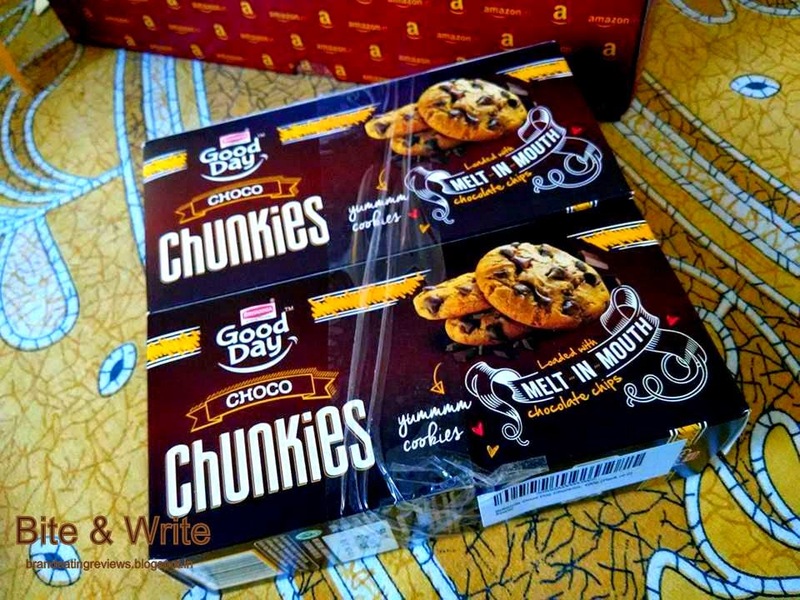 I was thrilled to know that I was one of those tweeps chosen by @GoodayCookies on Twitter to receive the #ChunkieSurprise. 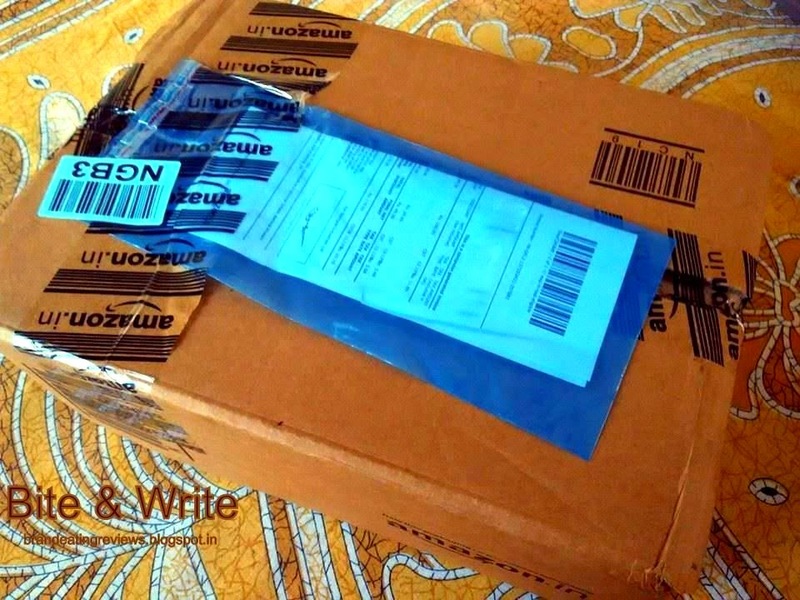 I received the goodies yesterday and that's when I decided to write a review. 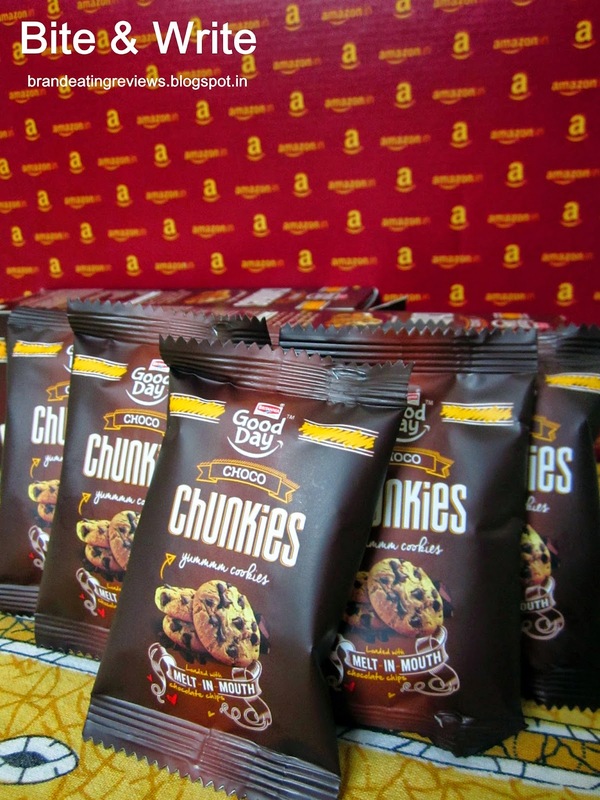 Good Day Chunkies are being positioned as a high-end snack. It's being said that it would be available for sale only for a few weeks exclusively on Amazon.in under their gourmet section. I received the package, which was packed really well in the carton. Inside the carton was something that looked like a gift-box. 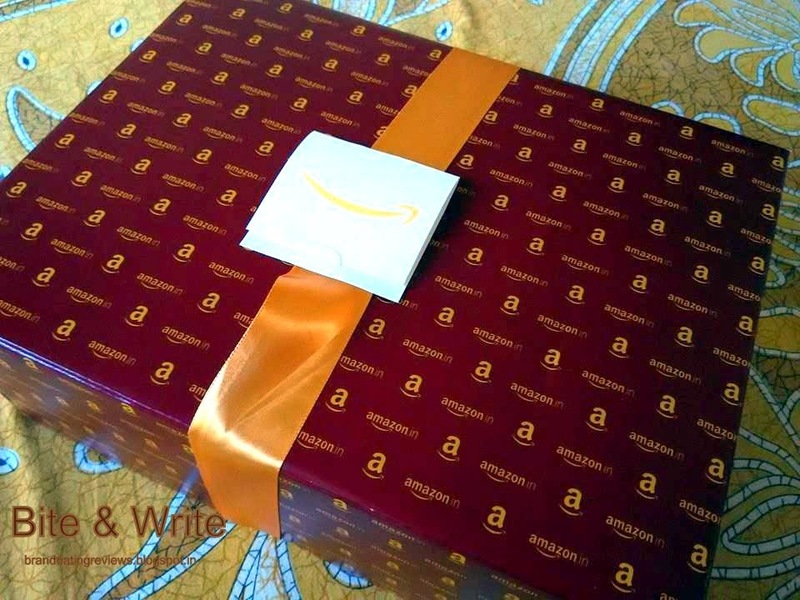 It was a shiny, box with 'Amazon.in' printed all over it. It had a really cute orange ribbon tied around it. It contained 2 packs of Britannia Good Day Chunkies, as you can see in the pictures below. Each pack was 100 grams (net weight) and contained individually packed 6 cookies. All of this looked very neat and sophisticated. Now coming to the taste test. I unwrapped a cookie and it looked fully loaded. It appeared pretty rustic to me, with all those cracks on the top which indicated the fact that it has been baked to perfection. You can see the chunks of chocolate on its surface. Then I broke the cookie into two. It snapped and reveal a treasure of chocolate hidden inside of it, which was somewhat gooey. The cookie smelled very inviting. First bite, and I was in heaven. The cookie was slightly crumbly. Personally, I do not like cookies that crumble a lot. This one was crunchy and had a firmer texture. It did not stick to the palate as well. The gooey chocolate was a combination of dark and milk chocolate. The rest of the cookie dough was not very sweet. It was considerably savory; salty to be precise. 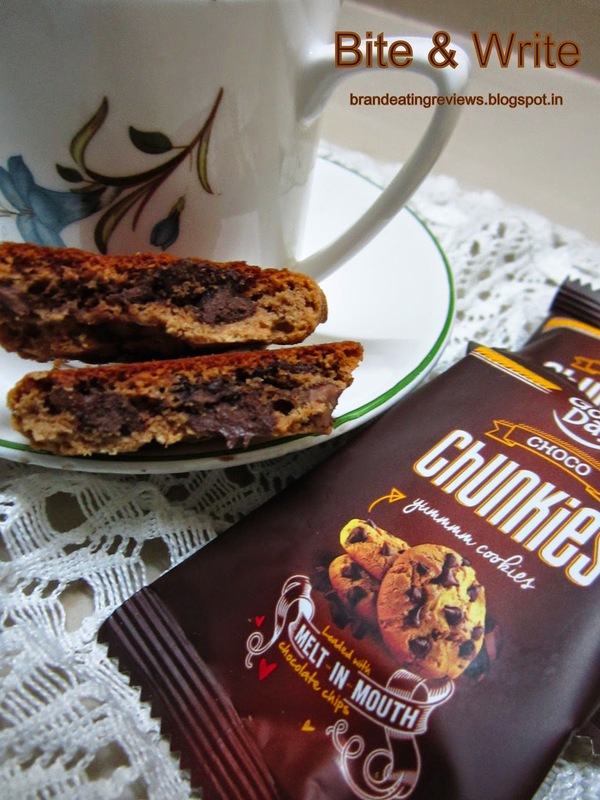 The combination of somewhat salty cookie dough and the sweet chocolate was really amazing. You do not get to experience such divine tasting cookies every day unless you bake them yourself at home. 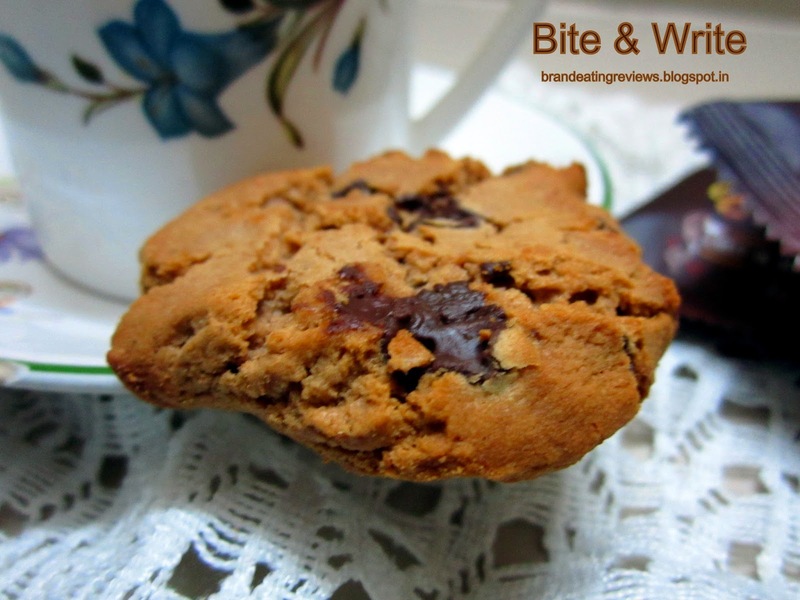 I am a big fan of well-made chocolate cookies and I know it when I see one. Let's take a look at the nutritional value. Nutritional Info - Britannia Good Day Chunkies per 100 grams approx. Now the big question. Would I like to buy them? ABSOLUTELY! I already ordered a couple of them on Amazon.in today. Mujhe bhi select hona hai to receive such goodies. I dont care about winning tablets or iphones..Mujhe ye sab chahiye! Yes, I wrote hinglish to tell you about my frustration. Share your insights with me!